Spare Tyre Theatre Company continues its creative engagement with the care sector with this gentle, participatory piece for people with dementia. A multi-sensory depiction of the seasons, the performance uses digital projection, music and non-verbal communication to connect with individuals whose powers of self-expression have been affected by their condition. The Garden moves through its transformations in an engrossing, interactive style – tidy enough to fit into the quiet room in a care home or a side ward in a hospital. Three performers bring the outdoors into an intimate space. Participants are invited to scrunch fallen leaves or simply watch them whirl around the walls, listen to the splash of a sudden shower and hum along as musician Nick Cattermole plays ‘Singin’ in the Rain’ on his flute or accompanies a recording of summer birdsong and bee buzz on a dulcimer. Actors Yolande Bramble-Carter and Charlotte Croft, under the direction of Arti Prashar, have mastered a warm, ‘person-centred’ approach to audience participation. They establish eye contact, return smiles and offer memory-jogging activities. They gauge the extent to which individuals respond to, and focus on the folding of a tablecloth, +footage of a tiny songbird cast on to a forearm using a dinky hand-held projector, or a hand massage with flower-scented lotion. 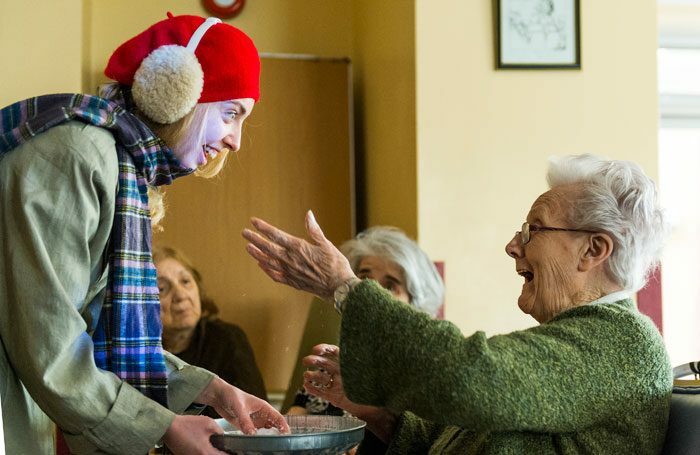 The result is a an experience that for audience members – service-users and carers alike – melds the workaday rituals of the care home with the sensory pleasures of each season in the garden, creating a little blooming of serenity in potentially stressful environment.